In keeping with the wedding theme, I thought I would blog about my wedding decorations, mainly because the majority of them were all handmade and vintage. To keep with the 1930s vision that I had in mind, I really wanted the feeling of a good old English tea party. I wanted something very simple and elegant and decorations that would bring the outdoors, indoors. Tea for one? Our table arrangements. 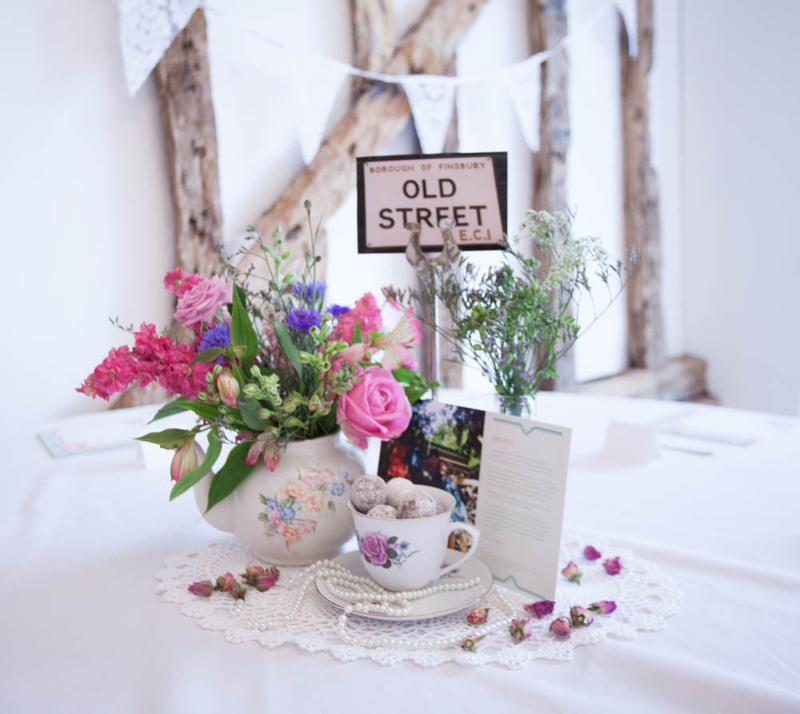 I loved the idea of flowers in teapots and luckily for me, my Mum used to be a florist so she's a dab hand at flower arranging! I thought this would make a really good centre piece for all the tables. We decided on a natural look for the flowers, so that they had that 'just picked' look. I didn't want anything too arranged, I just wanted it to look like they were fresh from the field or meadow. I spent weeks sourcing vintage teapots and teacups and again I was very lucky to have the help of my Mum and Sister. 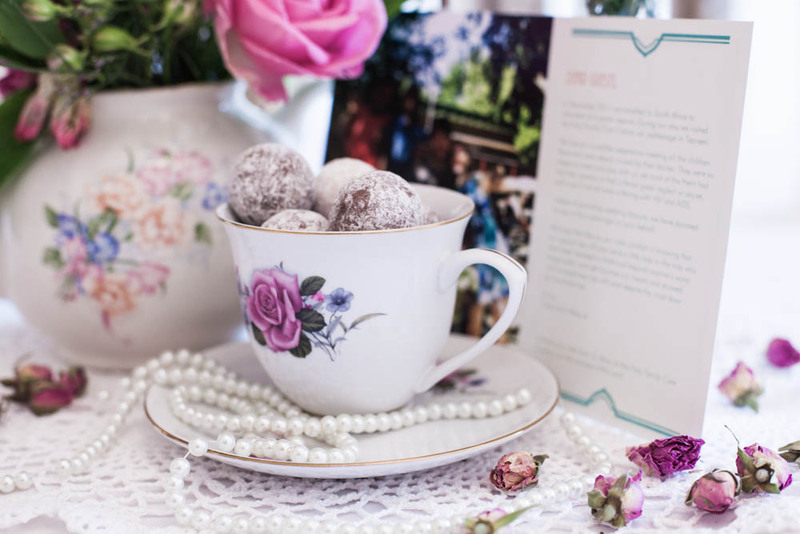 Together we found all the teapots and a beautiful set of teacups, which I used to fill with a selection of champagne truffles for the guests. I sourced a string of pearl-like beads and decorated each saucer, then scattered dried rose buds around the arrangement. I placed all of this on a crocheted doily I found on eBay. I decided against wedding favours. I couldn't find anything suitable and also I was astonished at the cost of these things, which may not even get taken home at the end of a drunken night :) So, we decided to donate money to a charity. In December 2011, we went to South Africa to volunteer at a game reserve. During our stay we took a day trip to a local orphanage, where we fell in love with the kids who were so amazing and happy to see us. Most of them were suffering with HIV and AIDS, had been abused or neglected, yet they had the biggest smiles on their faces and played football with us and sung songs. 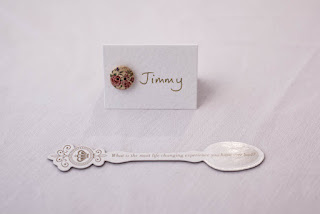 Instead of buying needless favours, we sent all the money to the orphanage and made up a card for each table letting our guests know we had done this on behalf of everyone at the wedding. For our table names we chose our favourite places in East London that mean a lot to us. My husband cycled to each spot and took a photo of the street sign, which we then printed in sepia and stuck onto post cards. 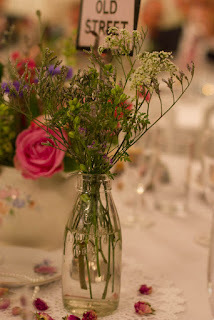 I also spent weeks bidding on vintage milk bottles from eBay to complete the idea of teapot, teacup, milk bottle. I wanted them to be as old as possible and even managed to find some dating from the 1930s. I loved the flowers that my Mum chose for these. 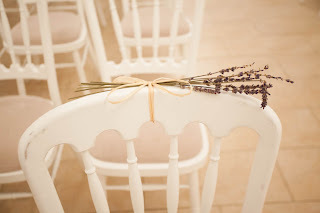 I really detest traditonal wedding decorations such as chair covers and those big organza bows and I thought it would be much nicer to keep the white wooden chairs that the venue supplied - we got married on a farm in a renovated barn. I ordered a large bunch of dried lavender stems and my Mum and Sister prepared each bunch with a raffia bow - it must have taken them ages but I think the lavender cured my Mum's headache! - and then the day before the wedding, with the help of my amazing bridesmaid Amanda, we tied them onto the backs of the chairs. The fragrance in the room was amazing! I also made our place name cards to save more money. I just ordered some plain cards and found some beautiful wooden buttons on eBay (thank you China!) and stuck a button on each card. My brother-in-law has really great writing, so he had the task of writing all the names. Thanks Andy! As we had a big BBQ for our dinner, we didn't need to worry about hiring or buying plates or cutlery (the caterer supplied eco wooden cutlery and nice plates) but I was worried that the tables would look a bit bare, so I had another think and found some really cool vintage style Cath Kidston napkins (eBay again!) and these neat little 'conversation starter' spoons. With the glasses (we hired these from Morrison's) and wine/water bottles the tables looked really neat and pretty and not the usual clutter of a wedding table. 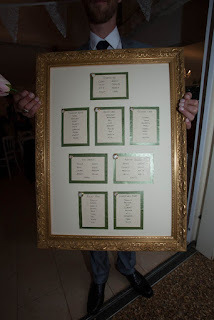 For my table plan, I liked the idea of a huge old ornate frame. On a random trip to the charity shop my Mum and I stumbled upon a painting for only 5 pounds. I snapped it up, bought some cream card and my folks set it over the painting. 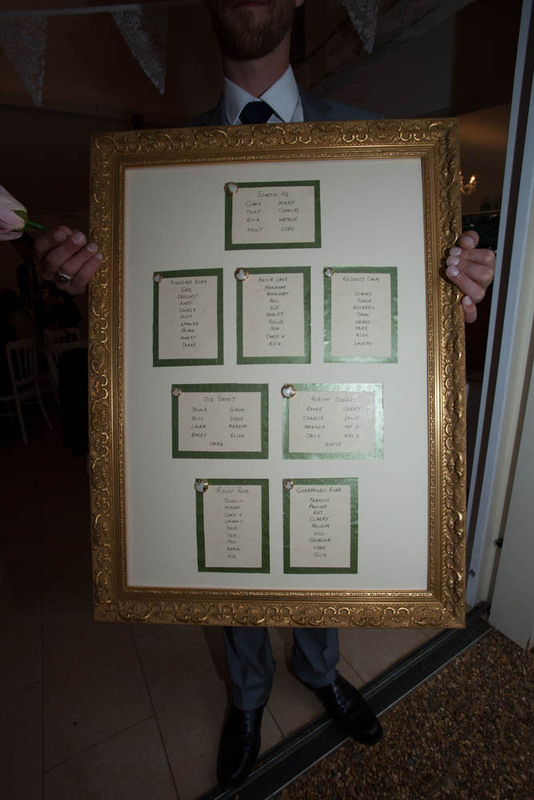 I then added the table plans, which were just some layered coloured card (in keeping with my invite art deco colours of ivory and sage) and some art deco style buttons I found in my haberdashery. I am really lucky to have a talented crafty sister. She made all my lace bunting! I couldn't believe how much she made, it was amazing. She used old net curtain that she found in a charity shop. 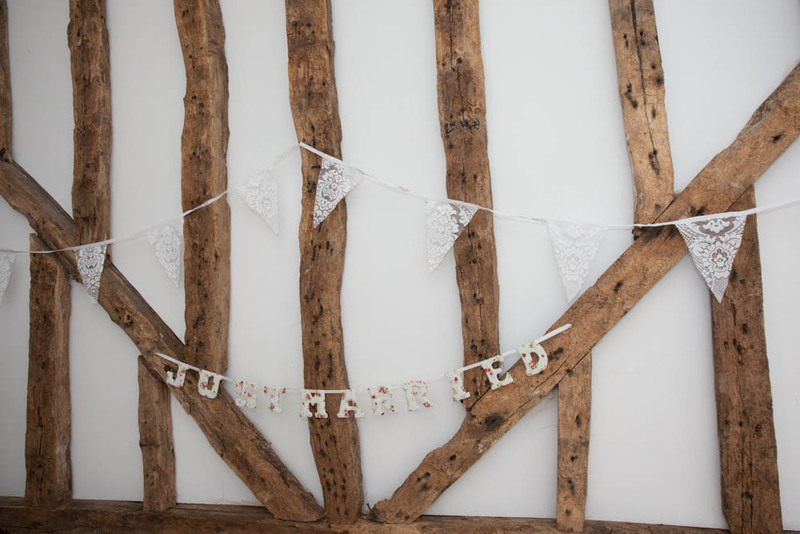 The 'Just Married' sign I bought from John Lewis for 12 pounds. This I have to show - my sister knitted me our ring pillow. 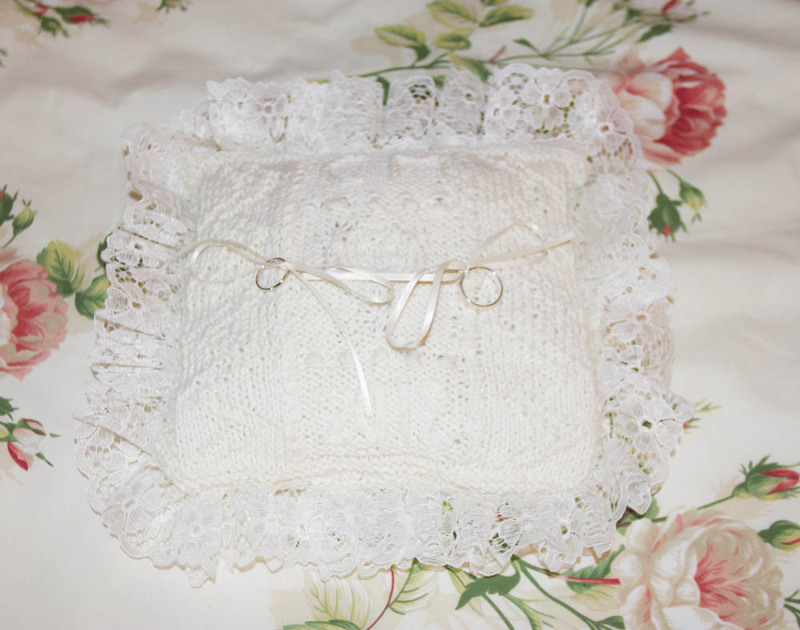 You might not be able to see from the picture but she 'knitted in' our initials and the year on it as well. So clever! One of my favourite things of all was my cake. My Mum and sister found the perfect cake maker who could do just what I wanted. I had fallen in love with the idea of a ruffle cake, which I saw one day on the internet. I couldn't think of anything else and my Mum was brilliant and had this made for me. We chose to have three tiers of cake mix inside: 2 tiers of lemon curd and poppy seed, and 1 tier of rich Belgian chocolate sponge. So you could either have refreshing lemon after dinner or indulge in some chocolate heaven. It was delicious! My Mum placed some of the 'sweet avalanche' roses on top that were also used for my bouquet. Oh my goodness - that cake looks amazing! And I love the idea of lace bunting - I hadn't thought of that before. Everything looks so special and just right - beautiful! You're very lucky to have such a crafty family. Hey, thanks for your comments Helen! It means so much to have nice feedback as it took so much time and hard work. The cake was just incredible. When I saw it I couldn't believe it. I don't know how the lady does it like that. I got attracted from theme weddings. But I have never gone through a wedding having vintage theme, but after reading your blog, I am feeling like I have attended the preparation of a vintage wedding. Hello Claire - your mum and sister were showing me your blogged wedding pictures last night at my Betty Makes craft and chat evening! 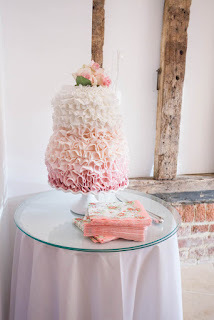 You are an inspiration to me wedding wise as I am making all my decorations for our wedding next year and you have also inspired me a great deal with your dressmaking as that is what I have been doing lately and have enjoyed using quirky fabrics to make something unique!! 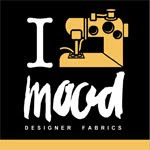 You make some lovely things and have fab ideas! I look forward to more of your creative posts!